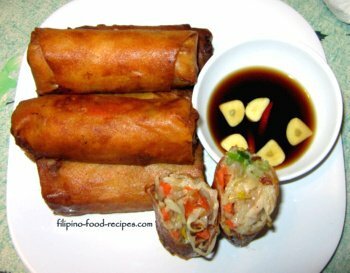 Lumpiang Togue is one of the popular fried vegetable eggroll favorites, with the mungbean sprout filling as the main vegetable ingredient. They are a common afternoon snack, usually peddled and comes with a side of spicy vinegar dipping sauce. Carrots, green onion and fried tofu are stir-fried with the mungbean, then cooled and wrapped in spring roll wrappers and deep fried until crispy. Have you had a vegetable eggroll that you need to spoon the vinegar dip instead of dipping it in because the veggie fillings tend to end up in the dip? That is why I put a binder in my Lumpia, even though it's not a traditional practice. After draining all the liquid sauce from the stir-fried veggies, I add one egg and a couple teaspoons flour before I roll them. This prevents the veggies from scattering all over the place. 5 Strain, then set aside and let it cool down completely. 6 Mix in one beaten egg and 2 tablespoons flour in the cooled veggies. 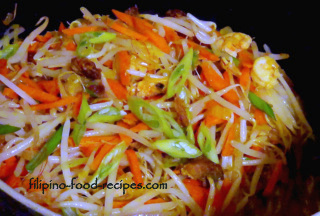 7 Lay a piece of spring roll, put 2 tablespoons cooked vegetables and roll, tucking both sides in. Finish wrapping all the vegetables and prepare to fry. 8 Heat up the pan with the 2 cups cooking oil, and fry the Lumpia until golden brown. 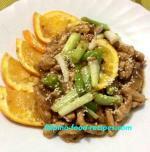 9 Serve with a spicy vinegar dip on the side. You can skip the egg and flour binder suggestion in this recipe. It doesn't really add to the taste, it's just a neat and convenient way of eating the eggroll. I use a paste of 1 tablespoon flour with 2 tablespoons water to seal the lumpiang togue wrapper so they don't unravel during frying. To re-heat a fried lumpia, pop it in a pre-heated 450 °F oven (or even a toaster oven) for 10 - 15 minutes or until the wrapper is crispy.